During the last few weeks of school, a parent donated a bunch of peg boards from an Optometrist's office. I knew we could do something awesome with them and it didn't take me long to come up with the idea to make them into stocking tasks!!! 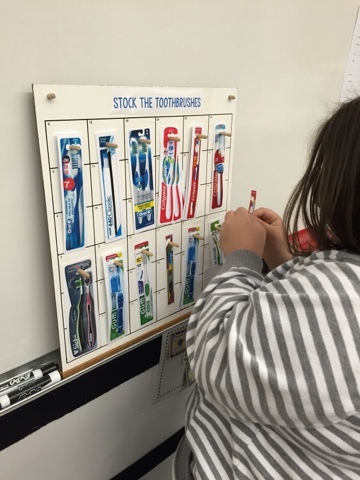 We were able to make a variety of stocking tasks by removing pegs as needed. I found pictures off of Google or Amazon and copied and pasted into PowerPoint. I tried to figure out the size as closely as I could, printed in black and white, checked sizing first, and once it was correct I printed 7 color copies on card stock. And then handed it to our wonderful laminating lady at school. She's the best. Doesn't even ask why I'm printing 72 pictures of toothbrushes or gift cards :) But then I made sure to show her what we made! After laminating it was as simple as cutting them out (you will definitely want a sliding cutter like this one, it's a lot of cutting) and putting a hole punch at the top. BOOM. Stocking task. My students seemed to really enjoy this one. I would ask them if they wanted to work at CVS or Walgreens, and then told them their job was to stock toothbrushes! This next task is a bit more challenging for students, since the brand is all the same and only the amount in the package and the colors change. This is when I learned that grabbing pictures off of Amazon worked so much better because I could search by brand and then grab related items. I really like this gift card one because it can also work on logo / brand recognition! 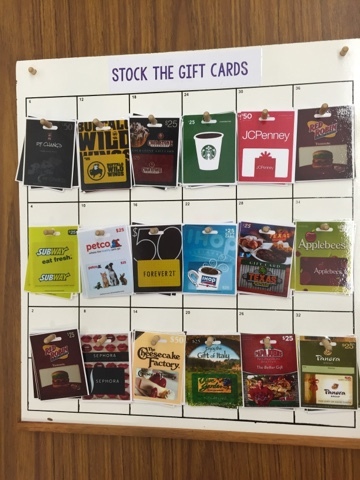 Also, I think students will be motivated to stock gift cards to places they know and recognize. Again, it was super easy to grab these images off of Amazon. And here is the last one I created before leaving on summer break - stock the seed packets! I like how similar they look, but they also have different colors and pictures. We didn't get to use them much this past school year since these were created in the last week or so, but I am really excited to offer this as another job skill for my students. And I have more peg boards, so will probably come up with more stocking tasks next school year! You can download the pictures I used HERE from google drive. I printed about 7 sheets of each page, in order to have 7 of each item, but you could do whatever number sounds best to you! Where do you think you could find peg boards if you don't have some randomly donated to you? I searched a little online, and you might be able to get them at Home Depot, or a similar home improvement store, and have them cut to the size you want. Would love to hear other suggestions! 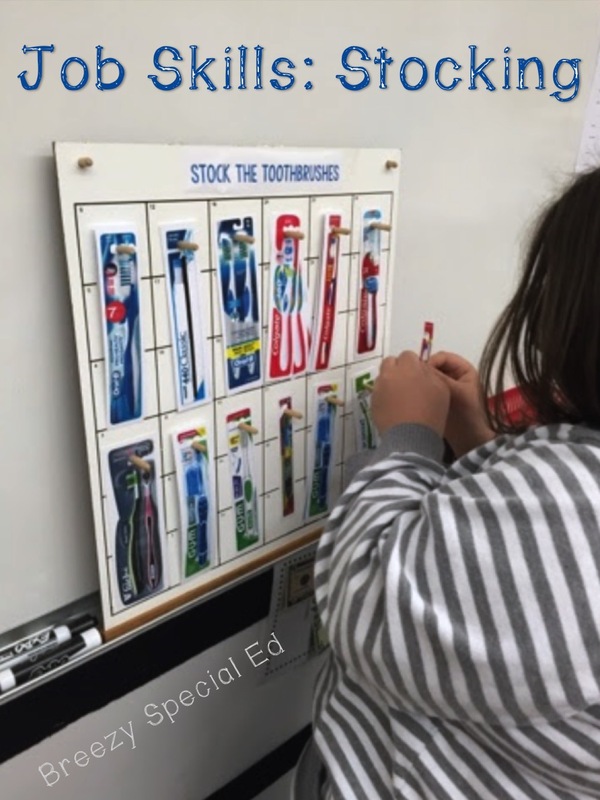 Great idea from reader Lisa and blogger Jannike from A Special Ed Connection - use 3M command hooks with small white boards or something else you have laying around! Then I got to thinking, command hooks on anything! Maybe even those foldable presentation boards. What great ideas! You are so creative! I absolutely love this and will be looking for peg boards. 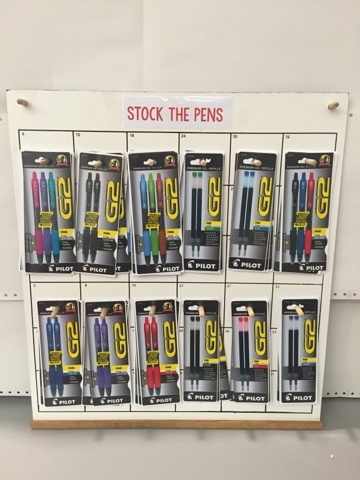 If I can't find any, I have tons of small dry erase boats and could use command hooks. Thanks for the awesome post! What a smart idea! I was trying to thinking of something else that would work. That's genius! I bet instead of white boards you could also use other things, like those cardboard foldable presentation boards maybe! I am making them now with the foldable presentation boards, Ill post a pic on instagram and tag you so you can see once I am done! How did you get all of those gift cards? They aren't actual gift cards, just pictures of them! I grabbed them off Amazon, and they are included in the templates linked above if you want some to make your own tasks with! Love this idea...as a new teacher this year I am excited to find ways to teach job skills as close to real life as possible. On the laminating - did you use the thick/hard laminate or the thinner type (that can be run through a rolling machine)? You can run things through the school laminator twice for thicker laminate! 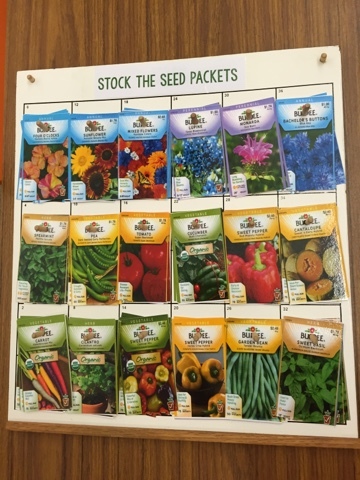 My students LOVE these activities....I actually found an 11 pocket jewelry holder at target for $2.50 and my students use that to place the gift cards and seed packages in the correct pockets.. I love this idea for my middle grades special needs classroom! I am getting to work on this idea right away! It will be ready for my students when they return to school in a couple of weeks! So in love with this task!! I was wondering if you can share the measurements of your peg boards so I can ask Home Depot to cut to size... Thanks!!!!! Hm, I'm not sure what size they are. You could always print the tasks and figure out how big you would need them cut! Love this idea! You could also do other products like make up, kitchen utensils, or pet toys and products. Love this idea thank you so much for sharing!!!! Where do you find the pegs? do you have any ideas of how to add an inventory component to this as well for higher level students?